Wonderful cycle moment. Decorated for full fire blast. I'm sure Grandma is loving it. 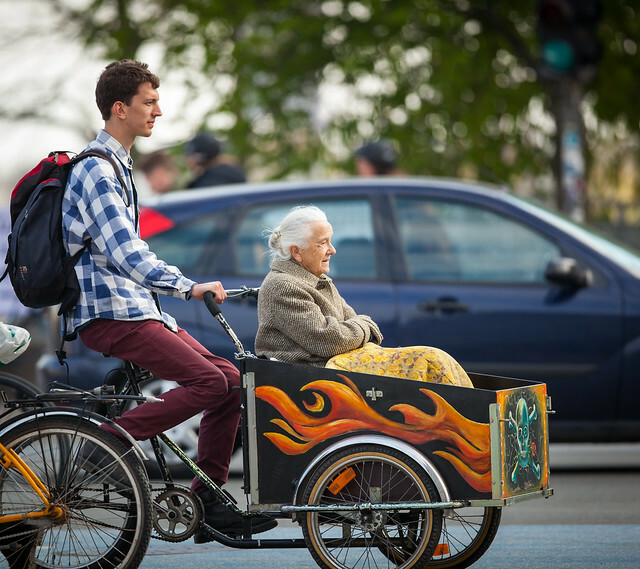 Lovely (she is of an age to be a GREAT-grandma) and that is a wonderful initiative for elders who can no longer cycle. However, I was hoping to see an ACTIVE lady of a certain age on her granny bike - and why not an active gentleman of the same vintage? I've just been discussing the 40th anniversary celebrations of Le Monde à bicyclette with a cyclist friend who is a granddad - I have no children, hence no grandkids either... just a very elderly cat.